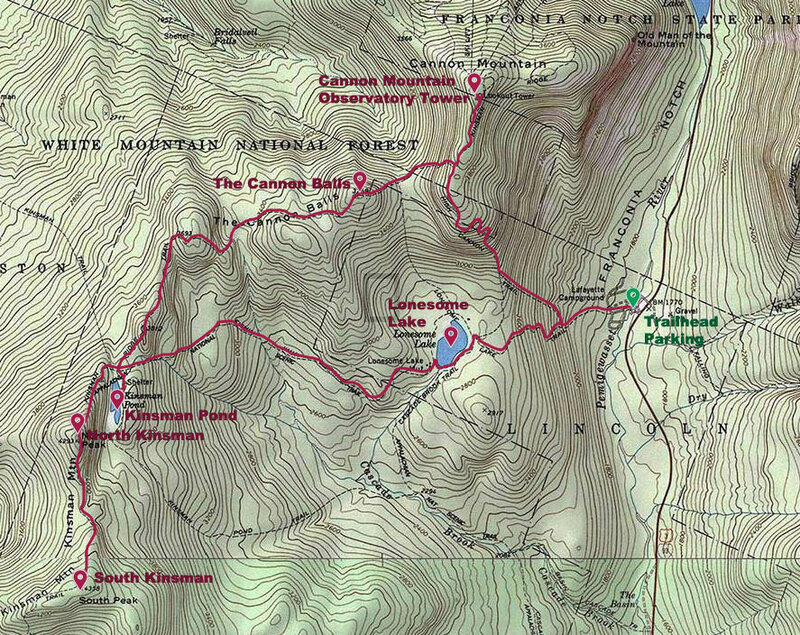 For some time I’ve planned on taking two days to hike a loop around Lonesome Lake in Franconia Notch State Park to do North and South Kinsman as well as Cannon Mountain. As my last mid-week-vacation-hiking-day for the year approached I found that I would be able to camp out the night before. So, I scratched my plans of doing Mount Moriah and decided to attempt this hike in one day. I would camp out at Lafayette Place Campground the night before, get up before dawn and complete the hike in time to make a reasonable boat back to the island. I woke at 4:45am, unable to sleep. As always I was as excited as a 5-year-old on Christmas morning. I quickly packed my tent and moved my car from the campground to the parking lot, grabbing a prime spot next to the Lonesome Lake Trail. My plan of attack was to take Lonesome Lake Trail up to Lonesome Lake, hop on Fishin’ Jimmy Trail and follow it to Kinsman Ridge Trail. 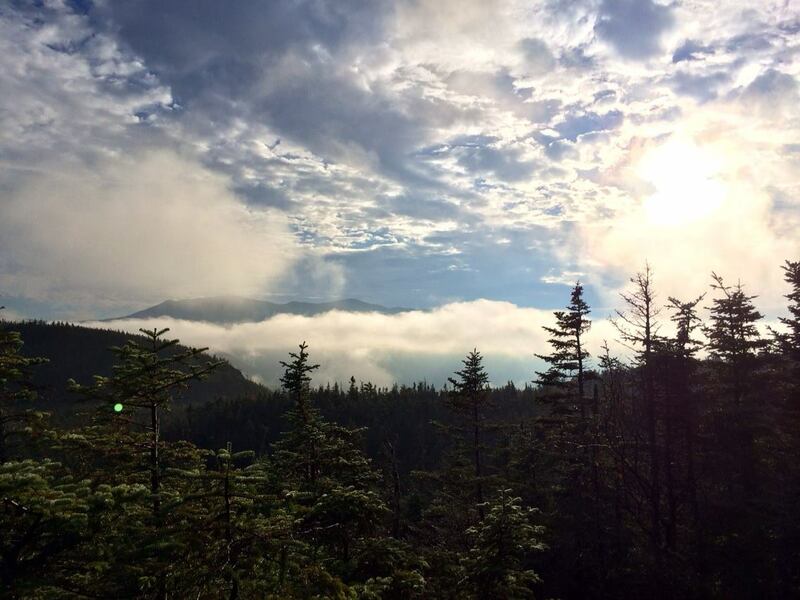 I would follow the Kinsman Ridge Trail south to the peaks of North and South Kinsman and then double back to the junction with Fishin’ Jimmy where I would stay north on the Kinsman Ridge Trail and follow it to Cannon Mountain. After Cannon I would follow Kinsman Ridge Trail a little south and take Hi-Cannon Trail down to Lonesome Lake Trail, following it back to the parking lot. I began up the trail with my headlamp in the pre-dawn dark. The trail started off pretty tame but soon climbed steeply toward the lake. As the sun began to rise I hit a thick patch of fog which limited my visibility and I flashed back to the night before, driving up the Kancamangus Highway. To say the least, the drive through the Kancamangus Pass was eerie. There was construction on the highway and the new pavement didn’t have the reflective lane dividers or the solid lines on the shoulder. The only guidance was the reflective tape of intermittent traffic cones on either side of the road. Parallel lines of hovering dashes cutting through the forest beyond my high beams lead the way. As I approached the height of land a car caught up to me and rode my bumper. Clearly it was a local who was not pleased that I was driving at a conservative pace. Suddenly, I hit a bank of fog and my visibility dropped to under 50 feet. I slowed despite the car on my tail. The highway swerved through the fog, hit its high point and started back down. When I finally broke out of the fog I pulled over at the first vista to let the local pass. I was about to start down the highway but took a look at the view, shut off my engine and stepped out of the car. A slivered moon sat starkly among the stars. It barely illuminating the peaks of Mount Kancamangus, the Osceolas and more beyond. A blanket of clouds draped across their peaks and drifted up and faded away as they flowed down their slopes. Far below I saw the headlights of cars skiing through the trees, making their way toward Lincoln. I made my way up to Lonesome Lake faster than I thought I would. One minute I was chugging up the slope, navigating large boulders, the next the path flattened out and I could see the grey waters of the lake through the trees. The sun had not yet risen, but it was light enough out to put away my headlamp. I made my way clockwise around Lonesome Lake. I had hiked this path once before with my brother on our first hiking brocation. Both times I have thoroughly enjoyed it and would highly suggest it to anyone looking for a challenging little hike. It is supposed to be exceptionally nice on a clear day when you can see Fanconia Ridge rising above the lake. Voices and lights emanated from the Lonesome Lake Hut as I passed it by and took up Fishin’ Jimmy Trail. The Fishin’ Jimmy Trail was named after a caretaker of Lonesome Lake Hut who was employed after the original owners had passed away. He was a character in a story named Fishin’ Jimmy by Annie Trumbull Slosson, one of the original owners’ sister-in-law. The original owners of the hut had stocked the lake with trout and built cabins on the far end of the lake, making it a popular fishing retreat. Shortly after the sign saying that I was leaving protected forest (areas within a 1/4 mile radius of established shelters in the White Mountains are protected) I saw a great stealth camping site with a young couple breaking down camp. They were the only people I saw all day until I was within easy walking distance of the Cannon Mountain aerial tramway. The lower half of Fishin’ Jimmy was a series of PUDs (pointless ups and downs) and the upper half was an interesting climb up slick rocks. I got to the junction with the Kinsman Ridge Trail and Kinsman Pond Trail well ahead of schedule. On the trail sign in the junction was a paper note written (presumably) by an Appalachian Trail thru-hiker. It said something along the lines of: “NOBOs: 0.1 miles to Kinsmans Pond, view worth the distance.” The note was for other NOrth BOund thru-hikers but I took the advice as well. As I made my way toward the pond the sun peaked out for the only time that day. I had to stop to capture a shot of it illuminating the moss on the side of the trail. 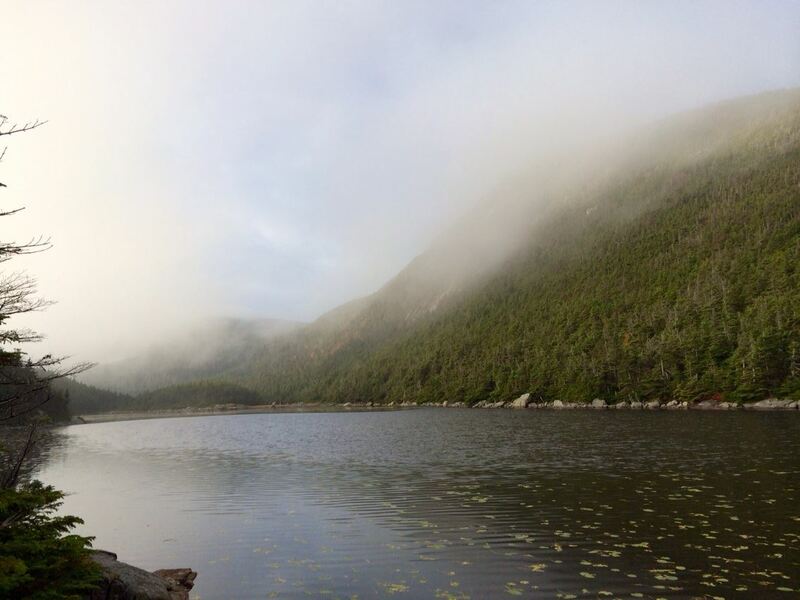 I approached Kinsman Pond Campsite and it was clear that no one was there. It was a nice location with tent platforms scattered through the thin forest and a shelter within a hundred feet of the pond. The tarn was the color of over-steeped tea, and North and South Kinsman peaks loomed overhead through the gathering clouds. It was definitely worth the side trip and luckily I was ahead of schedule and got to see the view before the clouds fully rolled in. I made my way back to the Kinsman Ridge Trail and started south up the trail to North Kinsman. I made my way careful over the slick rocks toward the peak, the whole way worrying about my climb back down. I was once again wearing my trail shoes which did not perform well on slick surfaces. 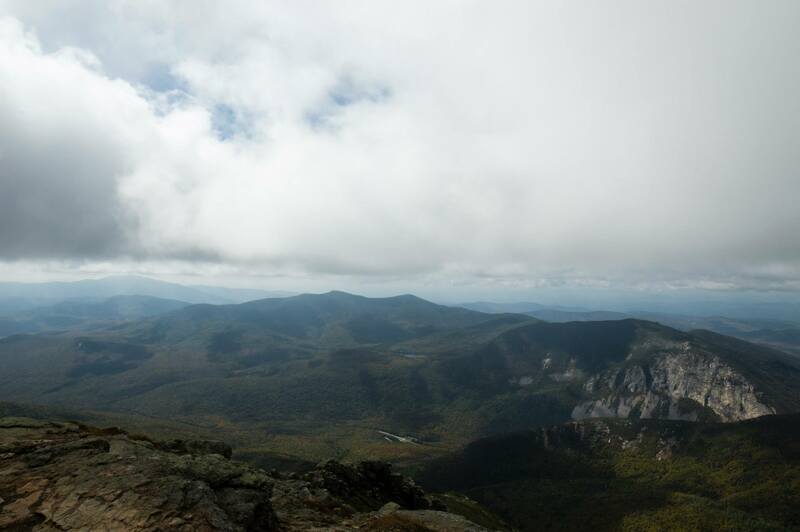 For a brief moment the clouds parted and Franconia Ridge appeared to the east. By the time I made it to the summit of North Kinsman the clouds had completely swamped it in. There was a great overlook just below the peak, but all I could see were clouds which occasionally parted to show more clouds. It was a quick two mile jaunt to South Kinsman and back with more cloudy views at the top. The elevation change between the two peaks was not terrible and the trail was more of the same slick boulders. I definitely felt isolated in between the mountains with the distance to any road so great, the lack of people and the clouds weighing heavily on the tree tops. When I got back to North Kinsman at 9am I ate half of my lunch, a soggy, all veggies sub from Subway. I then made my way carefully back down to the junction with Fishin’ Jimmy. I continued north on the Kinsman Ridge Trail toward The Cannon Balls and it quickly became clear that that section of the trail was not often hiked. 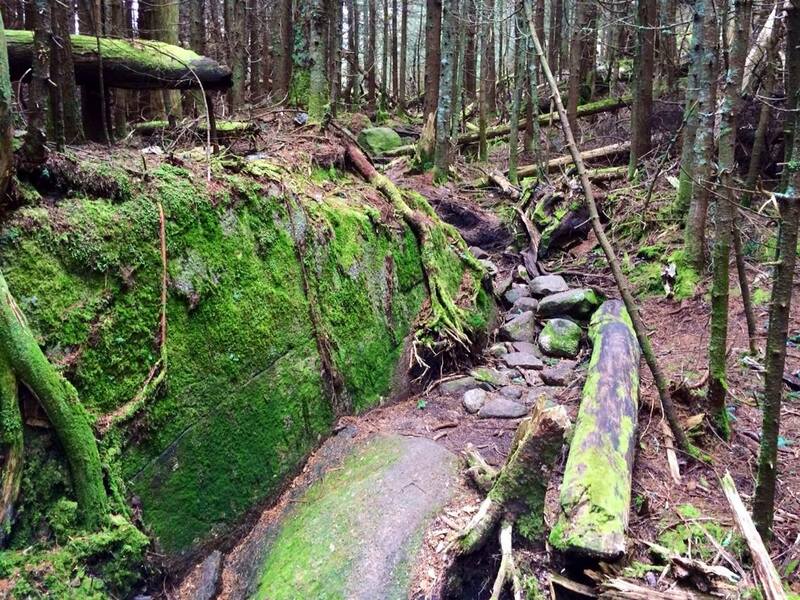 The trail had become narrow and overgrown with moss and fallen trees. Many parts of the trail were dark and gloomy, but occasionally there was a potential view (where I saw more clouds). As soon as I summited The Cannon Balls, a Hundred Highest, the trail became deep and wide again. It seemed like most people going for the Hundred Highest must take the Lonesome Lake trail all the way up to the Kinsman Ridge Trail and then follow it the short distance south to the peak of The Cannon Balls. The Kinsman Ridge Trail between Lonesome Lake Trail and Hi-Cannon Trail was a very steep climb over car-sized boulders. I really enjoyed the climb but had to stop often to catch my breath. I came across my first fellow hikers 6 hours into my hike as I closed in on the junction with Hi-Cannon Trail. They were two men who I had a hard time communicating with as they only spoke French and I only speak English. I believe they asked if the trail was harder down below and I tried to communicate that it was hard, but I didn’t know what was ahead to say whether it was easier or harder. As it turned out, it was much harder below as the trail soon leveled out. The distance from Hi-Cannon Trail junction to the Cannon summit was very flat. I made quick time but got behind a big group of people on the approach to the observatory tower. So, instead of going to the peak I followed Kinsman Ridge Trail a bit further beyond to a spot that overlooked Franconia Notch. The view was mostly of clouds, but breaks in the clouds hinted at more to see. After a few minutes I headed up to the observatory tower and got to it as the group was heading back to the aerial tramway. For a short time (between tram-loads of leaf-peepers) I had the observatory to myself. 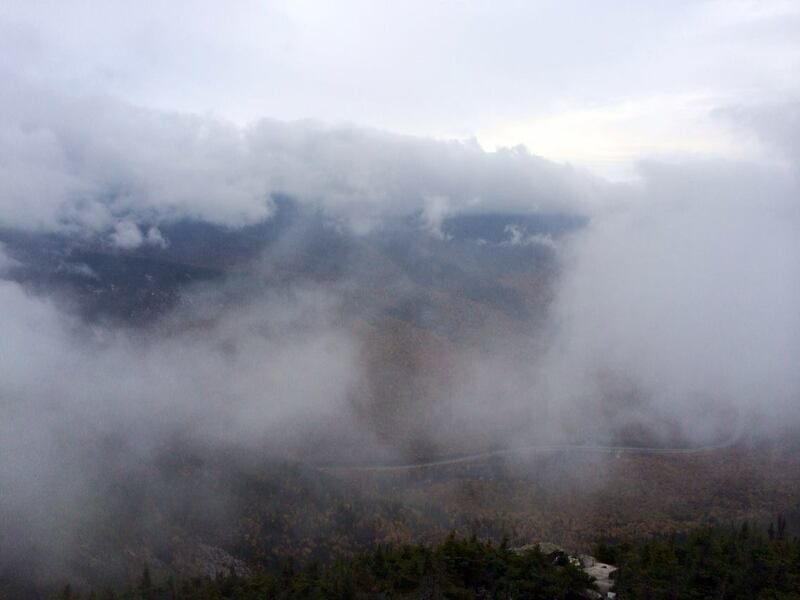 The clouds were starting to break up enough to see into Franconia Notch, with an occasional view of the towering ridge line above. When the next group of people hit the observatory I headed back down to the overlook to meditate and eat the second half of my lunch. I had begun to eat my Subway sandwich when another crowd showed up. Several people commented that “they have a Subway up here?” I pretended to chuckle at their wittiness while devouring the soggy mess. After eating my sandwich and a bit more of staring at the view of Franconia Notch I started off for the trailhead. I Didn’t know what to expect from Hi-Cannon but the top half was amazing. It was not as steep or rocky as the Kinsman Ridge Trail, it was more like the Old Bridle Path on the other side of Franconia Notch. About a third of the way down I came to a few amazing ledge vistas that overlooked Lonesome Lake and Franconia Notch. The foliage from that vantage point turned the notch into a flaming orange cauldron. After the vista the Hi-Cannon trail scrambled down a cliff face and dropped into the forest below. After the mid-point at Dodge Cutoff the trail became steep and gravely, with no rocks but an occasional root. It made for a great, quick descent. I was soon back to my car and ready to drive back to Portland. The drive back through the Kancamangus Highway was slow due to leaf-peepers. I had to stay aware as they constantly slammed on their break and pulled over to the shoulder to take photographs. But, the colors were truly amazing. I had been looking forward to this loop for a long time, and even though it was cloudy it did not disappoint. I finally got the solitude I was looking for, at least until the Cannon Mountain observatory tower. I definitely can’t wait to do Cannon again on a clear day, even if it is the second most frequented peak in the White Mountains. “Fishin’ Jimmy by Annie Trumbull Slosson.” gutenburg.org. Project Gutenburg. Web. 23 November 2014. “History of Lonesome Lake Hut.” outdoors.org. Appalachian Mountain Club. Web. 23 November 2014. “Lonesome Lake Hut at Cannon Mountain.” outdoors.org. Appalachian Mountain Club. Web. 23 November 2014. 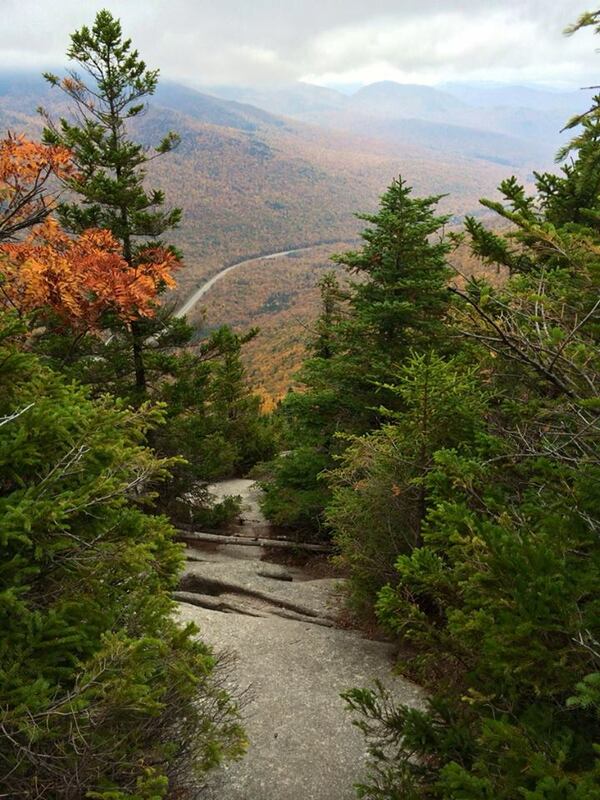 “Ride the Aerial Tramway to the Summit of Cannon Mountain.” cannonmt.com. State of NH Department of Resources and Economic Development. Web. 23 November 2014. 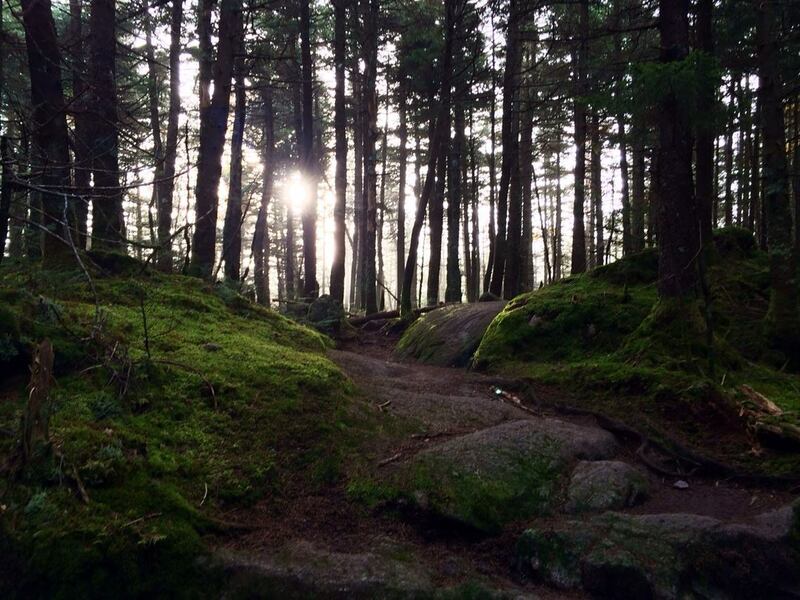 This entry was posted in Hike and tagged 4000 Footer, Cannon Mountain, Hike, Hundred Highest, Lafayette Place Campground, New Hampshire, North Kinsman, South Kinsman, The Cannon Balls, White Mountains National Forest. Bookmark the permalink.